Fabrizio Freda, CEO of Estee Lauder Cos, travels to China three or four times a year for a firsthand look at the cosmetics giant's business in what he calls "a most promising emerging market". But the "enormous" potential of the Chinese mainland - currently 5 percent of the company's sales - has the Italian-born executive thinking more-frequent visits are in the offing. Estee Lauder has racked up $21 billion in the increase in the company's market capitalization since 2009. The company is on track to pass the $10 billion-a-year mark when its current fiscal year ends on June 30. At a recent media briefing in his Manhattan office, Freda outlined Estee Lauder's vision for global expansion and emphasized China's role in the plan. "The future [of the Chinese market] is going to be pretty solid in my opinion, because there will be growth in the existing consumers, and new consumers will come into the business at the same time," said Freda, who became CEO in 2009. "We are investing a lot in our expansion in China," including in Tier 2, Tier 3 and Tier 4 cities, and with additional sales channels and hiring, he said. "Emerging markets are extremely important in the world of cosmetics - China, Brazil, the Middle East and many others. The growth of emerging markets is a double-hit." With 30 cosmetics brands - the biggest portfolio of any company in the luxury-goods industry - Estee Lauder operates in 150 countries and regions, with a global work force of 38,000. China is currently the company's third-biggest market. In first and second places, respectively, are the United States (where the company has a 38 percent market share) and the United Kingdom. Freda said the US is the "most promising emerging market" for the company's growth in coming years - using "emerging" to describe new trends of consumers age 65 or older and ethnically diverse groups such as Hispanics, African-Americans and Asian-Americans. Of Estee Lauder's 30 brands, 14 are available in China. Last year the company introduced a new skin-care brand, Osiao, which is formulated for Asian and Chinese women, to further leverage its rapid sales growth. Net sales in China increased about 28 percent in constant currency in fiscal year 2012. Two-thirds of sales there came from e-commerce, mostly from Chinese cities where Estee Lauder doesn't have a physical presence. To better serve the some 300 million Chinese who travel within the country each year, the company has opened stores in airports and train stations across China. "The China market is the single most important growth opportunity at this moment around the world," Freda said, adding that the country's growing middle class is a key sales target. While sales channels have so far been concentrated in Tier 1 cities such Beijing and Shanghai, the potential for developing local markets in less-populated - but nonetheless huge - cities is "enormous", according to the CEO. "When you go to a Tier 3 city in China, the consumers are maybe ready to buy but the distribution channels may not have arrived yet," he explained. The 5 percent of annual sales generated from the Chinese mainland is doubled when the impact of Chinese consumers' spending abroad, at retail outlets and international airports, is factored in. "The combination of both the domestic consumption and traveling consumption make Chinese consumers - wherever they are - probably the biggest source of growth." After studying the favored destinations of Chinese citizens, Estee Lauder created the concept of "travel corridors", in which product-launch decisions are geographically. Chinese consumers, for example, are most likely to pass through - and shop in - airports in Hong Kong, the Republic of Korea, Paris and New York, Freda said. Globally, the company controls about 15 percent of the prestige beauty industry, which has been expanding by 3 percent to 4 percent a year over the past decade. "We have plenty of space to continue to grow," said Freda, pointing to the Estee Lauder's goal of adding at least 1 percent to 2 percent to yearly sales for the foreseeable future. • Do you want to read a good book about World War II? 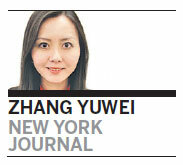 Journal by China Daily reporters in USA. Nobody is perfect, people expect best mannerism from foreigners though they themself show less hospitality. I think chinese could assimilate some western manners and knowledge about tbere culture through schooling prior to the visit of any other country. Respect of the local culture and more acceptance and kind reminding instead of only pointing fingers might help. As more and more go traveling, people will become more aware of international culture, maybe this will help too.